I don't own a lot of button down shirts. Although I love the great classic button down, it's the fact that that I have trouble finding ones that fit well, that has prevented me from adding them to my wardrobe. When you're unfortunately blessed with a large chest (some think it's a blessing, I've always considered it a curse) mixed with slim shoulders, most blouses will either pull at the chest, or be too large in the shoulders. So when Sumissura, a tailor made clothing company, contacted me to try one of their products, I couldn't give up the chance of having a button down shirt made to measure just for me. Not only do you submit your measurements for a perfect fit, but you can customize every detail on the shirt. You choose the style, fabric, and all the little details from collar type and size, to cuff type, to pockets, and you can even add personal details like monogramming if you wish. It doesn't end with shirts either, they have everything from pants, to blazers and coats. After placing my order, I received my shirt within two weeks, and am very happy with the fit. Because I love classic pieces that have a twist, I added french cuffs, making the sleeves a little more interesting. I love that I can wear them down, making them extra long, or folded for a more formal look. I have to worn you though, there are so many prints to choose from, narrowing it down can be a little tough! Wow - this look is seriously stunning, Rachael! Love the mix of textures you've captured in these photos. That shirt is so something I would wear! Amazing outfit-- I love the unexpected twists on these classics-- too cool! You chose a very nice shirt that looks so pretty on you! I like how you wore the french cuffs down. Great idea! I always wear them folded. Have a great week! I love this look! Edgy but classic at the same time. Love the whole look, especially the jacket and the shirt, they way you have styled it. I heard on you on finding a great button down, they just never look as effortless as they do on others. However, your striped looks lovely with skinny and camel jacket. You look so amazing! Love this look! Those jeans are so cute! Oh my god i love that look its so polished! Such a great and polished outfit! Great striped shirt! That top fits you perfectly! 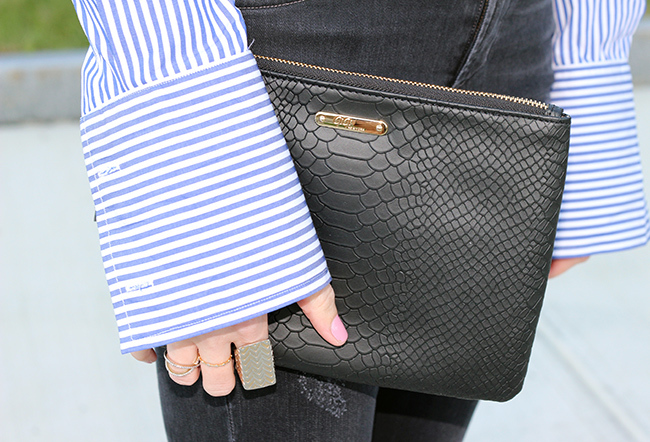 I love the classic stripe you picked and how you paired it with distressed denim and camel. You always have the perfect denim! Beautiful classic shirt! Love your leather jacket too! Super chic, girlfriend- love the jacket thrown over that great striped shirt. Lovely outfit, I really like the striped shirt! I love a well-fitted classic shirt! This one looks really great with the brown leather jacket too. your blouse is amazing, so great that it was custom made for you! Love the cuffs! Love your jacket and shirt!! You looks so great!! Amazing casual chic, love the shirt! Those jeans fit you so very well - I love them. And I love the new shirt too - those sleeves. Paired with your gorgeous clutch and moto jacket this outfit is classic with an edgy twist. Those jeans are so cute on you, especially paired with that awesome jacket! So cute!! Love this look!! Your jacket is awesome!! This is a great look and you are spot on that it is classics with a twist! This button down is classic with a twist. I am LOVING the wide cuffs at the wrist.